The bitterness he expressed indicates a genuine concern, not something made up for the purpose of embarking on a different career. It is important therefore to consider what originally prompted what he characterizes as distrust, and which led to his own lack of confidence. The General traces this to the period almost immediately after the war ended, with the President’s statement, which he quotes at some length, that there was no need to expand the army further. He refers this to the first Security Council meeting after the victory over the LTTE on May 18th. The date of the meeting is not mentioned. However about a week after the victory, the General made a public statement that a great expansion of the army was necessary. On May 26th the Wall Street Journal reported, with an Associated Press byline, that the Sri Lankan ‘military’ planned ‘to enlist at least 100,000 more soldiers’. The story cited General Fonseka, as I remember well, since it led to much questioning, on lines we had suffered previously too with regard to statements he had made which seemed to reject the pluralistic policies of the government. In this case, though we were able as in the previous case to point out that this was not government policy, the criticism was that the assertion sent out the wrong message, suggesting continuing militarization when what was desirable was affirmation that normality had been restored. Previously, in responding to criticism of his statement about Sri Lanka belonging to the Sinhala majority, we had responded by pointing out that Gen Fonseka had not intended at all to suggest that there was no place for minorities, and that any suggestion of a majoritarian outlook was not government thinking. My point that Gen Fonseka was expressing his individual views met with the riposte that an army commander should not make public pronouncements on such issues, which I did not think a necessarily valid principle. The assertion about expanding the army, which again I had thought an individual assertion, has to be seen in a fresh light if it had been specifically advised against by the President. Certainly, from the words the General quotes, in both letters of resignation, it is clear that the President was not in favour of the idea. It is also a tribute to the President that he did not let his Army Commander down publicly, by repudiating his declaration, but instead made it quietly but firmly clear that this was not government policy. I should note that I am not sure of the exact date on which the President made his point at the Security Council, but it looks like the beginnings of distrust sprang from the different perspectives about this matter and their expression. At the same time, it is possible that the distrust had necessarily to run deeper, if these different perspectives were symptomatic of irreconcilable views about the direction the nation should be taking after the defeat of terrorism. Gen Fonseka’s assertion that the President’s statement indicated mistrust of the army seems farfetched. What the General reports the President as having said, that there was strong public opinion about the country having a too powerful army, was not at all surprising, in terms not of mistrust, but of prevailing needs and what was being circulated by international elements opposed to the government, that this army would be used to limit freedoms in the North. Gen Fonseka’s assessment then, ‘I personally felt that your Excellency has commenced mistrusting your own loyal Army’ seems extreme. It does however explain the mistrust that developed since, given that his reaction included public pronouncements challenging the government position. Understandably then the government felt the need for leadership that would adhere by government policy willingly. 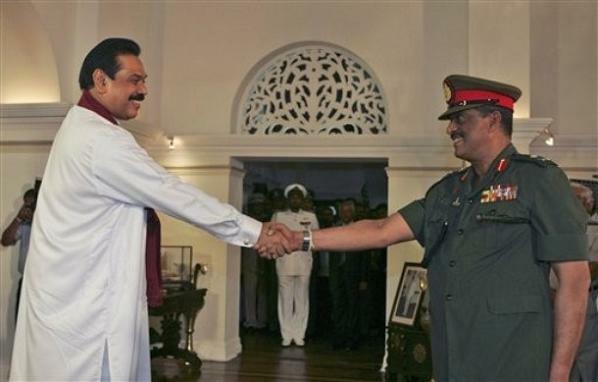 Thus a change of command in the army, though the fact that Gen Fonseka was made the Chief of Defence Staff, as opposed to the Navy Commander, whom he also mentions resentfully in his letter of resignation, suggests that mistrust of his other intentions was not an issue at the time. What happened after that cannot be deduced from the letter, though obviously there were elements, which had disapproved previously of the manner in which the General had led the army, which were ready and able now to fish in troubled waters. They succeeded in creating an atmosphere of mistrust, and that this is now genuine to the point at which the General feels unable to continue as CDS is clear from the letter. It should be registered however that his initial reaction to the President’s decision not to expand the army was highly individualistic. Indeed, far from that decision being an insult to the army, it stressed the unique nature of the recent achievement. The officers and men, of all services, who defeated the LTTE, had joined and stayed with the army in difficult times, and deserve all respect. Raising their number by half as much again, or even more, when life would be relatively easy, would have placed in the same category a vast number who would not have been as deserving of the current high regard in which current members of the forces are held. Obviously we need to maintain the spirit that was shown in the past few years, but that is better done by small and selective absorption rather than mass recruitment. That the General mentions his disappointment at the President’s approach then suggests that there are more fundamental reasons for his concern than his comments about civilian hardships towards the end of the annex to his letter. At the beginning of that annex he also engages in personal comments about his successor, in a manner that is at odds with the otherwise dignified tone of the letter, and suggests deep personal anguish. Still, none of this should take away from the fact that he did a great job at a time of difficulty. All those who worked with him at that juncture should therefore hope that those who worked against him then will not make maximum use of his human feelings and then cast him aside with contumely, as they have done to so many others.